How can search and social marketing teams work together to make both their efforts more effective? You can use social media as a distribution network for content, but realize that today, organic social traffic is not guaranteed. In the session “SEO & Social: Let’s Dance!” at SMX Advanced, speakers Jason White, Maggic Malek and Travis Wright will share the latest ways marketers can leverage the social world to help advance SEO, build brand awareness, and engage with prospects. From employee advocacy to remarketing ads, there are many options in the overlap between search and social. Jason White (@sonray), VP SEO & SMM for DragonSearch, starts to talk about distribution networks. Social media is a fascinating distribution network. As an industry, a lot has been written about the declining reach of organic. If you’re a small brand building an audience, it can be a really frustrating, slow process to see that your social media posts don’t get seen by many people naturally. Employee advocacy (which White thinks is a silly name) describes the process in which brands get bigger reach through their employees’ social profiles. When the concept first was introduced to Jason, he found it creepy — but he can’t deny that it works. It works because it has greater reach than that of the brand in some cases. The influence that employees can gain for a brand can’t be ignored. There are two main aspects to establishing an employee advocacy program. First, there’s the networks they’re on. Then there’s the mechanical aspect — what are you looking to deliver through their networks? Optimize as much as you possibly can and find the wins. White says not to look just at social, but get these employee advocates to be blog authors. Their names matter. Build them up. A lot of people only look at employee amplification and leave it at that, but if you’re looking full funnel you see email, chat, forums, and other places where you can leverage that employee’s voice. Some companies are collaborative, some are creative, some are competitive — and some are controlling. In a controlling environment, your employee advocacy strategy might be a little bit different. But it can still work. Employees are brands in and of themselves. They should have the freedom to share and not share as they think fits their image/reputation. Not all messages should be shared by all participants, and that’s okay. Month 1: Get comfortable. Form a weak baseline. Month 2: Require tweaks to the process and get deeper insights to form a stronger baseline. Month 3: Hit your stride. People feed off competition. The prize doesn’t have to be crazy. People feed off competition. The reward could be a gift card or a half day off or anything. If the program is dying, a reward can get things going again. Written content is now graphic content. Social traffic is not guaranteed. Social engagement is a different ball game. Brands have to pay to play. Identify moments that matter. “I believe that everything is better if you lead with the head and follow with the heart,” says Malek. The head is search and the heart is social. Both have to be constantly talking to each other and exchanging data. You must understand yourself as a brand and know exactly who you are conversing with. Define your spirit and stand for that spirit in every aspect of search and social. What are people searching for in the privacy of their own Google search box? What are people saying about your product to their friends? How are they interacting with your competitors? What customer service issues are they having? Some metrics measure awareness: Reach/impressions, engagement, mentions, clicks/CTR, site traffic, brand awareness and sentiment. Other metrics measure conversions, or reaching goals you’ve set, such as: leads, checkouts, conversion rate, average order value, cart abandonment rate, customer retention rate and customer LTV (lifetime value). Success looks different for every brand. What metrics will you be looking at? Hero: Large-scale tent-pole events or “go big” moments designed to raise broad awareness. Hub: Regularly scheduled “push” content designed for your prime prospect. Hygiene: Always-on “pull” content designed for your core target. Hire the most amazing writers as brand ambassadors. We as people don’t like to read crappy content. Assign a dedicated team. There’s a lot going on in search and social, and it’s really, really hard to do both. Identify collaborators on each team. Establish a cadence to data share. Chart your course with data, but let your heart lead the way. Rally around content that represents who you are. Develop a relationship on social media that allows you to glean even MORE data from your consumers to personalize their experience. Convert social sensations into content opportunities. Travis Wright (@teedubya), chief marketing technologist for CCP Global, is up. He’s talking fast about the overlap of social with both organic search and paid search. He has a lot of slides to share! Search and social is all about content. We have to create epic content. Content can be great, but it’s useless if no one hears it. Analyze your content via BuzzSumo. Figure out who shared your content. Then make a Twitter ad campaign to target those people. After people visit your site, you want to track your prospect. When the prospect leaves, your ad will show up on another site. Use pixels. 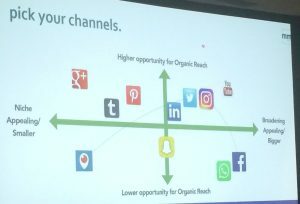 Wright says organic reach is over. Marketers need to be prepared to use paid reinforcements. Also watch my pre-SMX interview with Jason White and Maggie Malek for more insights on the opportunities between search and social. 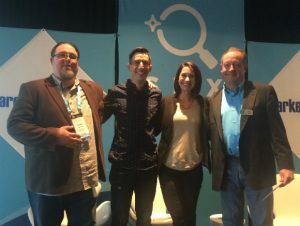 Like our liveblog coverage of SMX Advanced? Subscribe to the BCI Blog and get new posts by email. It is really worth to give a time on reading your blog. Hope in near future I could so-called Digital marketer. Employee Advocacy is really very effective for company growth. If the company keeps their employee happy by providing all the services they need then definitely why not all the employees will recommend their company’s products to their friends and family. It’s a sudden growth in company revenue. Kristi, you have really explained very well, especially those three methods as Timeline. Just to back up what you’ve said, my business has seen by FAR it’s biggest return on investment through the use of retargeting, via facebook ads and adroll (other providers are available!). Just be sure to limit your campaigns so people aren’t still seeing the same ads after they’ve taken the action you want them to.